It seems KAZE UK might know something we, or anyone else in the UK Anime Industry, doesn’t; as on the latest batch of Bleach DVD’s, which is titled Bleach – Series 15 Part 2 and due out on the 29th June 2015, there is a relatively long trailer promoting the Tenkai Knights anime series – and its the same trailer thats seen on VIZ Media Europes website. Of course seeing trailers for shows that haven’t received a UK confirmation are all but too common, especially with the recent string of MVM Entertainment releases; however what makes this trailer different is that these discs have been specifically created for the UK Market – whereas the discs distributed by MVM have been produced for mass-market across multiple countries. This means that the possibility for Tenkai Knights to be released into the UK is quite high; especially considering VIZ Media Europe own the European license to it. But what exactly is the Tenkai Knights anime series? Well it was a joint venture between Canadian and Japanese studios to help promote Spin Master’s line of Ionix brand of construction bricks; bricks which, much similar to LEGO, can be used to create all sorts of things but mainly robotic characters. The Anime itself, having been broadcast on Cartoon Network in America last year, spans 52 episodes and sees these robotic characters do battle against each other with the help of human partners; the anime series even helped spawned a fighting game spin-off, known as Tenkai Knights: Brave Battle, which was also released last year by Bandai Namco Entertainment onto the Nintendo 3DS. 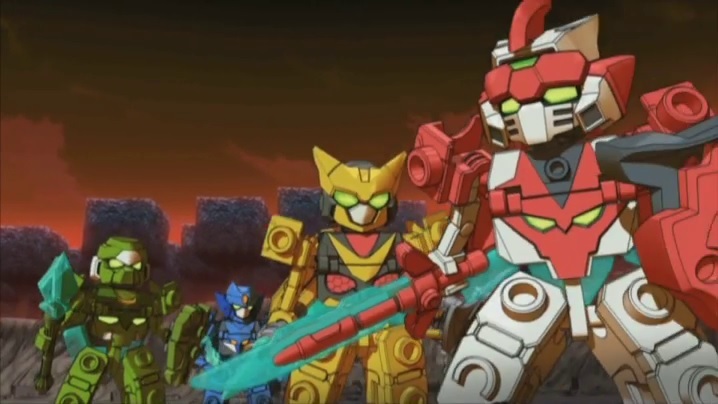 As it stands the possibility of the Tenkai Knights anime series reaching UK shores is all but a mystery; but it would make a nice welcome addition and make a nice alternative to the series that are currently dominating the market.